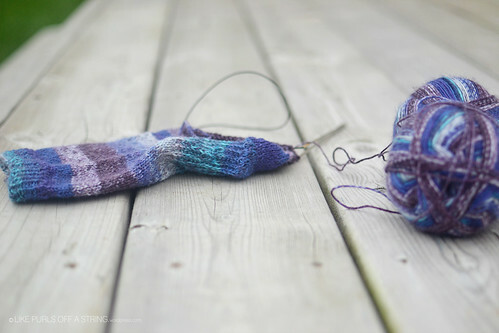 Knitting :: My October socks for Liesl’s sock challenge! 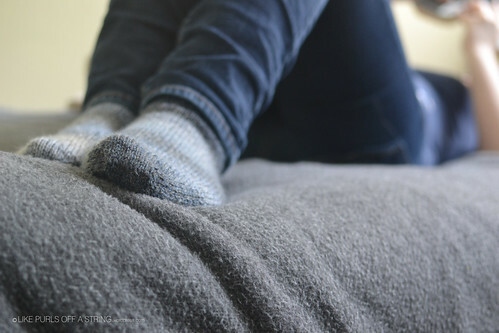 I finished my September socks last month and I’ll be sharing photos of them later this week. 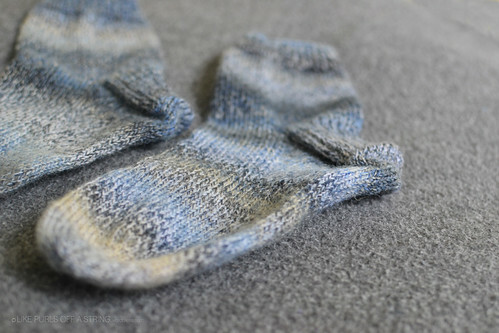 The October socks are another pair of my favourite plain sock pattern and the yarn is Lana Grossa Meilenweit. 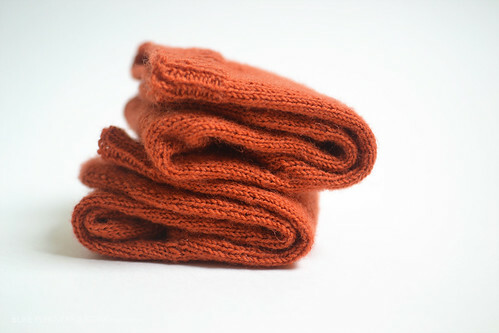 I love this colourway… it might be my favourite self-striping colourway ever. Reading :: The Birth House by Ami McKay. This is a historical fiction novel based in Nova Scotia about a young midwife, and I’m loving it so far! I’m reading it on my kindle when I have a moment between classes or waiting in line somewhere, so it’s going a bit slowly, but I can’t wait to finish it! Lord of the Flies by William Golding. This is one of the classics that I somehow missed out on reading in high school. I’ve just begun, but I keep hearing such strong reactions to this book that I’m excited to see what I think of it. 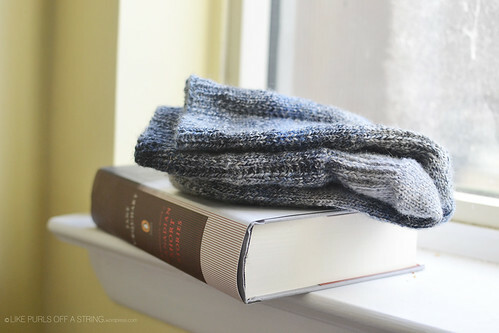 What have you been knitting and reading lately? 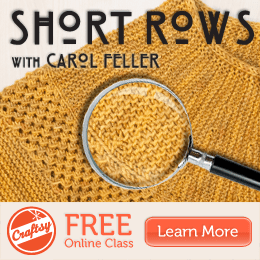 Linking up with KCCO and Yarn-Along. I am so close to being finished my exams… one more tomorrow! It’s in the evening until 10pm, which isn’t great, but after that I’m off for the summer (and to find a job)! I’m also moving on Saturday (back to my parents’ house for the summer), so the next few days are going to be busy ones. Appropriately, I also finished my exam socks today! I made these up as I went along, but they’re pretty basic- toe-up, short row heel with gusset, and 1″ of ribbing at the top. I also made these quite tall, I worked even for about 5″ after the heel. 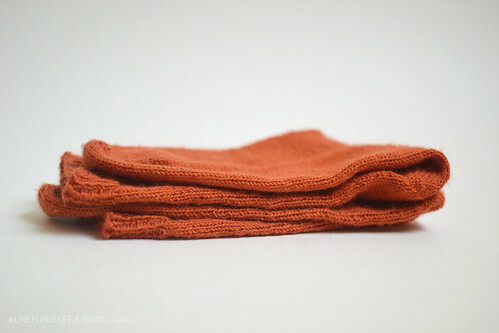 The yarn is Lion Brand Sock-Ease in 133 Circus Peanut. This was my first time using this yarn and it’s a pretty average sock yarn. What I really loved about this skein was the colour! It’s so bright and cheery for spring, which was much needed today as we got the annual ‘I thought we were done with this’ April snowstorm. These are also my (very late) March socks for my 12 socks in 2014 challenge, since I never finished the socks I cast on in March. I’m hoping to finish another pair this month so I’ll be back on track! I haven’t been doing a lot of reading this week outside of my coursework, but I have been sneaking in a few pages of House Girl by Tara Conklin when I have a spare moment. It’s a great novel, and I’m really liking how the historical and modern timelines play off each other. Let me know in the comments what you’re currently knitting and reading! If any of you are also writing finals, good luck! Have an amazing day. I mentioned last week in my post about my Vanilla Latte Socks that I was working on another pair of Vanilla socks… and here they are! 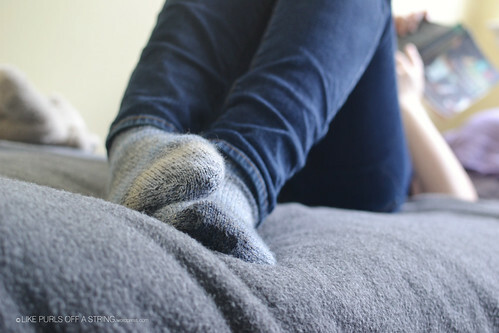 These are the Plain Vanilla Socks in Patons Kroy Sock. I really like how these turned out- the length of the leg is perfect and they fit well. The only tweak I made was to use 1×1 ribbing for the top cuff rather than 2×2- I find it doesn’t stretch out quite as much that way. These socks are my second pair this year, so I’m on track with my goal of finishing 12 pairs this year! 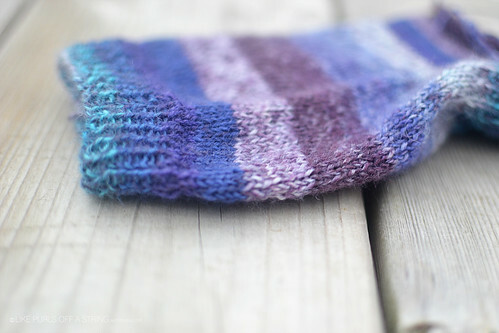 I’m going to start another pair this weekend, so I can get a head start on next month’s socks! I also have a quick announcement today… a bunch of designers, myself included, are doing a little donation drive during the Olympics and Ravellenic games to voice our support for those whose human rights are being oppressed in Russia. From tomorrow (Feb 7) to Feb 9, I’ll be donating 50% of my total pattern sales to Egale and for the remainder of the games (Feb 10-23) I’ll be donating 25% of my total pattern sales. Any of my patterns are eligible. If you’d like to see the other designers participating, Bristol Ivy has compiled a list on her blog. Thanks for your support! 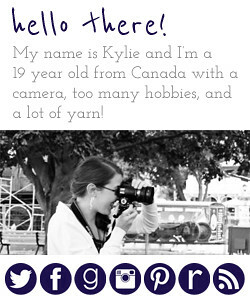 I’ll be linking up (a bit late) with KCCO and Yarn-Along as usual! 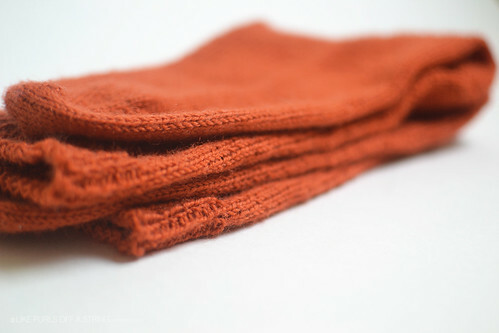 Knitting :: Finished my Vanilla Latte Socks in Patons Kroy Sock (Rav link). I love how they turned out! These are my first pair of socks in my challenge to knit 12 socks in a year! I’m working on my Plain Vanilla Socks now, in the same yarn. Apparently this week is vanilla themed! Reading :: The Penguin Book of Canadian Short Stories (selected by Jane Urquhart). This is for a Canadian Literature course that I’m taking and we’re reading selected stories from this (giant!) anthology. (Goodreads link). Mockingjay (by Suzanne Collins). I finished Catching Fire this week so that I could see the movie, and it made sense to just finish the series. I enjoyed the first book, but the next two in the trilogy aren’t quite as good. I’ll probably finish this just to find out what happens. (Goodreads link). Watching :: The fifth season of Community (so good now that Dan Harmon is back!) and the second season of New Girl, which was recommended to me by a friend. I am enjoying way it more than I expected… the characters are great and it’s quite funny. 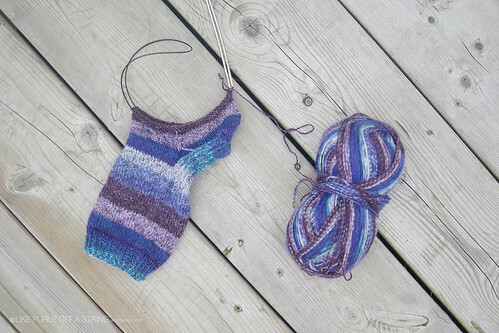 I hope you are all having a wonderful week – let me know in the comments what you’re knitting, reading, and watching! 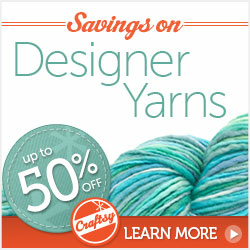 I’ll be linking up with Yarn-Along and KCCO as usual.